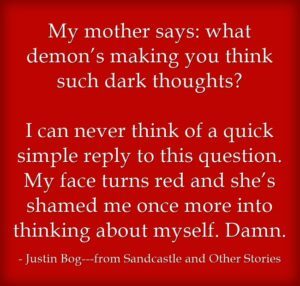 This first red-boxed quote is from the short story Speak the Word. 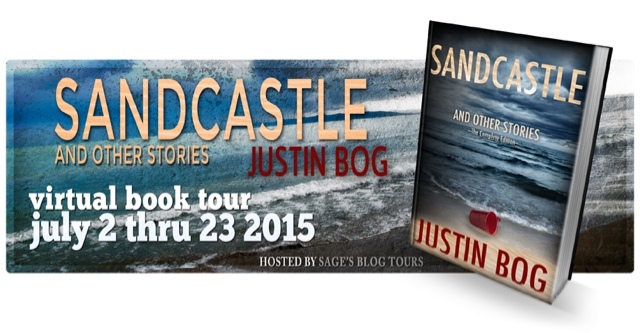 Today begins my book tour for Sandcastle and Other Stories: The Complete Edition. I will be touring, dropping by blogs, being interviewed, spotlighted, and finishing up on my fiftieth birthday, July 23rd. How time passes. If you haven’t read these twelve dark tales yet, what are you waiting for? It’s the perfect collection for summer reading beside any pool of water . . . add an icy frozen drink like the denizens who haunt the decks in the story When the Ship Sinks. The title story is about a cheerful visit to the beach (I imagined the waves of The Jersey Shore) that goes chillingly wrong . . . There are other tales where water plays a thematic role, wells, darkness, even the huge drought we’re experiencing, make recurring appearances. 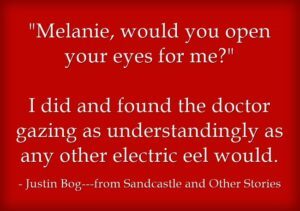 I loved reading Mallory Heart Reviews today, my first stop, and if you would like to read Mallory’s review of Sandcastle and Other Stories: The Complete Collection, please click HERE! 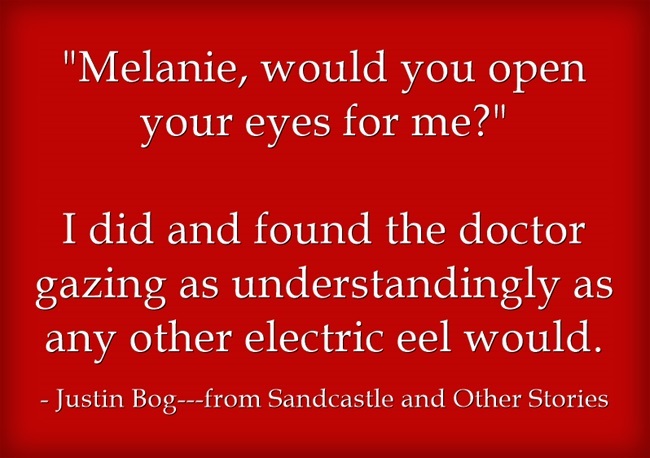 This next red-boxed quote is from the short story Poseidon Eyes. If you’ve already experienced my first dark collection, please know that I will be selling the two new stories separately as a kindle eBook-only edition titled Speak the Word. Look for this eBook towards the end of July. And, please, enjoy the beach, shade yourself under a red-and-white-striped umbrella, but watch out for Brenda . . . or she’ll bury you. 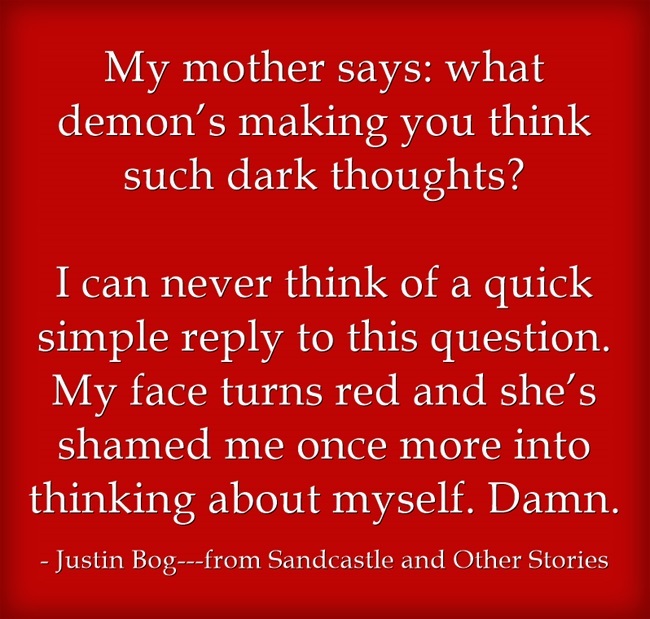 Remember to order your paperback copy from your local independent bookseller and tell them about Justin Bog books! Means the world to me. If you shop at Amazon and purchase the paperback from them, the eBook kindle version is free in their Matchbook program! If you are a member of a Book Club, I love being invited to speak at book clubs. They are interesting for any author to experience, getting feedback and critiques first hand and seeing the stories from a new perspective. I encourage readers to think about inviting me into their world. This opening moment is from the title story Sandcastle.